Approved by the International Iridology Practitioners Association, our courses are superior in quality. Ellen has studied and worked in the field of iridology and natural healing for nearly 30 years, and is renowned for her work in Comprehensive Iridology™. Take the first step in preparing Iridology certification with our easy-to-follow course. 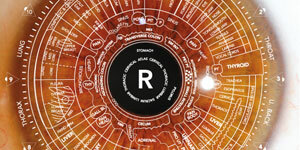 There are four basic constitution types according to iridology - learn which section your eye may be categorized into with a complimentary analysis. Ellen's love for Iridology is now available to you! By reading her e-books and watching her educational videos you get started with a world-renowned mentor. Our e-books compliment the course to become certified - simply follow the step by step course instructions to receive an Iridology Certification. She has extensive international clientele, and runs her own Iridology practice. Ellen studied the science of Iridology for several years with the legendary natural healer, Dr. Bernard Jensen, at the Hidden Valley Health Ranch in California. She became a protégé, learning all that he had to teach in the fields of Iridology and Nutrition and is the only person who has written permission from Dr. Bernard Jensen to place his seal on iridology certificates. "Excellent book and very informative." "This book was a lot easier to understand than most that I have read. Like the pictures and the charts. It makes it so much easier to understand. I would recommend this book is you are interested in reading the eyes. I’m anxious to learn more. It is amazing that you can read a person’s body through their eyes, hands, feet and even ears. Isn't it amazing what your body can tell you without an MRI." "Iridology is very interesting to me, and I feel this is something I would have done if I had known about it earlier in life. It is hard not to look into people's eyes now without critiquing them! I wish this was something widely used. Great book to learn the concept." What Are Your Eyes Saying About Your Health? Discover the amazing wealth of health information that can be found within your eyes! "7 Ways Iridology Can Change Your Life!" FREE ebook with a newsletter signup!